Cold-adapted enzymes are proteins produced by psychrophilic organisms that display a high catalytic efficiency at extremely low temperatures. Chitin consists of the insoluble homopolysaccharide β-(1, 4)-linked N-acetylglucosamine, which is the second most abundant biopolymer found in nature. Chitinases (EC 3.2.1.14) play an important role in chitin recycling in nature. Biodegradation of chitin by the action of cold-adapted chitinases offers significant advantages in industrial applications such as the treatment of chitin-rich waste at low temperatures, the biocontrol of phytopathogens in cold environments and the biocontrol of microbial spoilage of refrigerated food. A gene encoding a cold-adapted chitinase (CHI II) from Glaciozyma antarctica PI12 was isolated using Rapid Amplification of cDNA Ends (RACE) and RT-PCR techniques. The isolated gene was successfully expressed in the Pichia pastoris expression system. Analysis of the nucleotide sequence revealed the presence of an open reading frame of 1,215 bp, which encodes a 404 amino acid protein. The recombinant chitinase was secreted into the medium when induced with 1% methanol in BMMY medium at 25°C. The purified recombinant chitinase exhibited two bands, corresponding to the non-glycosylated and glycosylated proteins, by SDS-PAGE with molecular masses of approximately 39 and 50 kDa, respectively. The enzyme displayed an acidic pH characteristic with an optimum pH at 4.0 and an optimum temperature at 15°C. The enzyme was stable between pH 3.0-4.5 and was able to retain its activity from 5 to 25°C. The presence of K+, Mn2+ and Co2+ ions increased the enzyme activity up to 20%. Analysis of the insoluble substrates showed that the purified recombinant chitinase had a strong affinity towards colloidal chitin and little effect on glycol chitosan. CHI II recombinant chitinase exhibited higher Vmax and Kcat values toward colloidal chitin than other substrates at low temperatures. By taking advantage of its high activity at low temperatures and its acidic pH optimum, this recombinant chitinase will be valuable in various biotechnological applications under low temperature and acidic pH conditions. Extremophiles are microorganisms that can grow and thrive in extreme environments. Proteins, especially enzymes, isolated from the extremophiles are of particular interest because of their ability to function effectively and remain stable near extreme conditions . Psychrophiles are organisms that live at very low temperatures and can be found in several perennially cold environments, such as the Antarctic. The survival of the psychrophilic organisms at low temperatures (cold-adaptation) are due to several factors such as temperature sensing, reduced membrane fluidity, stabilised inhibitory nucleic acid structures, the formation of intracellular crystalline ice and cellular responses that counteract solute uptake rates and lowered enzyme reactions . Recently, psychrophilic enzymes are becoming more attractive in industrial applications, partly because of ongoing efforts to decrease energy consumption. At low temperatures, the kinetic energy of reacting molecules is too low to allow reactions to occur. Psychrophilic or cold-adapted enzymes compensate in this situation by having a highly flexible protein structure and conformation, thereby increasing their thermolability and a high catalytic efficiency at a low energy cost [2, 3]. To date, many cold-adapted enzymes have been successfully isolated and their expression studies have also been conducted. This includes the glycosyl hydrolase group of enzymes, such as lipases , α-Amylases  and chitinases [6, 7]. Chitin is the most abundant biopolymer found in nature after cellulose and attracted special interest as a reusable material [6, 8]. This polysaccharide is a crucial structural component in fungal cell walls and certain green algae and is a major constituent in the shells, cuticles and exoskeletons of worms, molluscs and arthropods, including crustaceans and insects . Chitin comprises 20 to 58% of the dry weight of the marine invertebrates, which include shrimp, crabs, squids, oysters and cuttlefish . The enormous amounts of chitin continuously generated in nature require disposal and recycling on a formidable scale . Previous studies revealed the broad range applications of chitin in various biochemical, food and chemical industries. Patil et al. showed that chitin can be used in human health care as an antimicrobial, anticholesterol or antitumor agent. Chitin and its derivatives are also used in wastewater treatment, drug delivery, wound healing and dietary fibre . Due to chitin's important biological role, its synthesis and degradation has been the subject of extensive research. Chitinases catalyse the hydrolysis of β-1, 4-linkages in chitin. Many organisms produce chitinases for different purposes . Chitinases produced by bacteria and plants are important for nutritive purposes and in fungal invasion, respectively. All chitin-containing organisms such as fungi and yeast produce chitinases (EC 2.4.1.14) and chitin synthase (EC 2.4.1.16) to mediate cell wall synthesis and growth [12, 14]. Chitinases are classified into two families of glycosyl hydrolases, family 18 and family 19, based on the amino acid sequence of the catalytic regions . Family 18 contains chitinases from bacteria, fungi, viruses, animals and some plants . Cold-adapted chitinases are always characterised by low optimal temperatures and increased structural flexibility that is achieved through a combination of structural features . Heat labile and cold-adapted chitinases have been reported from several psychrophilic bacteria [7, 17], plants  and fungi . However, a cold-adapted chitinase from psychrophilic or psychrotolerant yeast has yet to be reported. Due to difficulties in getting significant amount of native chitinase of G. antarctica PI12 for protein purification, initial expression of the CHI II gene was carried out in E. coli system. However no expression was observed (data not shown). This could be due to the reduced stability of recombinant psychrophilic proteins expressed in a mesophilic host such as E. coli[20, 21]. An alternative host to E. coli is the methylotrophic yeast, P. pastoris which can be regarded as a moderate psychrotrophic organism that can grow at temperature as low as 12°C. This strain has emerged as a powerful and inexpensive expression system for the production of the eukaryotic recombinant proteins . In this study, we described the isolation and recombinant expression of a psychrophilic chitinase (CHI II) gene from G. antarctica PI12 in P. pastoris. Purification and characterisation of the expressed recombinant CHI II were also conducted. Subsequent biochemical characterisation of this enzyme suggests its usefulness in some biotechnology applications. A nucleotide sequence obtained from a GSS survey of the G. antarctica PI12 genome was identified to encode the consensus domain of the glycosyl hydrolase family 18 using NCBI databases. Further analyses suggest that the nucleotide sequence encoded part of a chitinase gene sequence. Isolation of the full-length chitinase gene was accomplished by RT-PCR followed by RACE amplification. A DNA fragment of approximately 500 bp was obtained from the RT-PCR method. Due to a lack of DNA information for the G. antarctica PI12 chitinase, RACE techniques were used to amplify the full-length cDNA sequence. The RACE method was conducted using the RNA of G. antarctica PI12 and the 5' and 3' portion sequence of the full-length cDNA was obtained by 5' and 3' RACE, respectively. About 1100 bp was amplified from 5' RACE and approximately 1200 bp from 3' RACE. Conjugation of the 5' and 3' fragments revealed a full-length chitinase cDNA of 1215 bp containing a 404 bp ORF, a 448 bp 5' untranslated region and a 121 bp untranslated flank at 3' end. The latter includes a polyadenylation signal AATAAA located 23 bp to the 5' side of the poly A tail and a ATTTA sequence, which is involved in the targeting of mRNAs for rapid turnover. Based upon the RACE sequences, a set of primers was designed (CHI-For and CHI-Rev) and the full-length cDNA sequence was amplified via the RT-PCR method. The cDNA sequence was deposited into GenBank with the Accession No. : JF901326. The DNA sequence encodes a 404 amino acid protein with a calculated molecular weight of 42.9 kDa and a theoretical pI of 9.65. Previous studies reported that the chitinases from various organisms had a molecular mass of about 40-80 kDa. The recombinant chitinase from Clonostachys rosea had a molecular mass of 43.8 kDa , whereas the recombinant chitinase from Chaetomium cupreum and Vibrio sp. Fi:7 was found to have a molecular mass of 58 kDa  and 79.4 kDa , respectively. A SignalP  prediction revealed that the CHI II protein contains a putative N-terminal signal peptide of 19 amino acids in length with a predicted cleavage site located between A19 and E18 (THA|||EL). This result suggested that this enzyme is secretory in nature. Analysis of the CHI II sequence by NetNGlyc 1.0 Server  showed that there is one potential N-linked glycosylation site at position -371. Interproscan  analysis predicted that CHI II encodes a glycosyl hydrolase family 18 member because of the amino acid segment "FDGVDLDWE" at nucleotide position 498, which matches the consensus catalytic sequence pattern [LIVMFY]-[DN]-G-[LIVMF]-[DN]-[LIVMF]-[DN]-x-E of chitinases in family 18 glycosyl hydrolases. The CHI II InterPro Accession No. is IPR001223, indicating that it is a novel member of the family 18 glycosyl hydrolases (endochitinase) and belongs to the chitinase class II. Based on a Blast search analysis, CHI II showed low similarity to all proteins in the database with an identity of 34% to chitinase from Puccinia triticina and 33% to endochitinase from Amanita muscaria. A low identity of the CHI II sequence with the available sequences in the database suggested that this chitinase from G. antarctica PI12 was a newly isolated chitinase sequence from yeast. CHI II appears to be a simple and compact chitinase with an N-terminal sequence encoding for a signal peptide and a C-terminal catalytic domain (CaD). Interestingly, neither the chitin-binding domain (CBD) nor the Ser/Pro/Thr rich linker, which were often associated with the catalytic domain in family 18 chitinases, was found in CHI II (Figure 1). This finding supports the study by Wang et al. that showed that a single CaD is sufficient for the catalytic activity of chitinase and further suggested that the CBD may facilitate hydrolysis of an insoluble substrate  but was not required for chitinase activity. 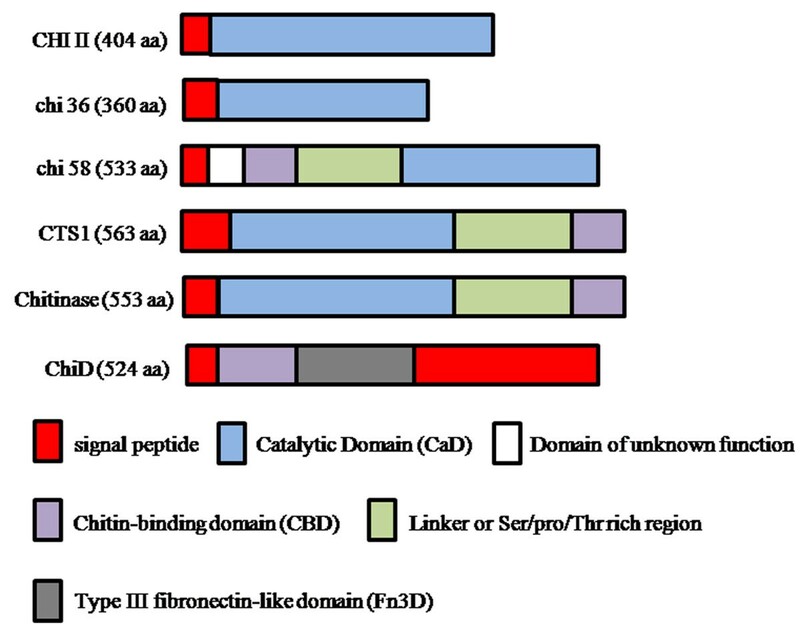 Figure 1 shows the domain organisations of family 18 chitinases that demonstrates the similarity of the CHI II domain structure with the chitinase from Bacillus cereus (chi36)  and the differences from others. It is unclear whether CHI II from G. antarctica PI12 evolved from multidomain chitinases as an alternative mechanism to proteolytic cleavage for the acquisition of high efficiency soluble chitinolytic activity. Domain organisation of family 18 chitinases; G. antarctica PI12 (CHI II), Bacillus cereus (chi 36) , Chaetomium cupreum (chi 58) , Saccharomyces cerevisiae (CTSI) , Lacanobia oleracea (Chitinase) and Bacillus circulans WL-12 (ChiD) . A multiple sequence alignment of the catalytic domain was conducted using the DNAMAN programme (Figure 2). Five catalytic domains of chitinases from other eukaryotes were chosen and aligned based on their strong identity to the chitinase from G. antarctica PI12. This core region contains two conserved amino acid regions, each consisting of SxGG and DxxDxDxE, which are highly conserved among the family 18 chitinases and may constitute the catalytic pocket [15, 23]. Importantly, residues that are essential for chitinase activity, particularly Asp144, Asp147, Asp149 and Glu151, were also observed in the CHI II catalytic domain, implying the crucial role of these residues in the catalytic activity and structure of chitinases . Multiple sequence alignment of the core region of the catalytic domains between CHI II and some eukaryotic chitinases. Highly conserved regions, SxGG and DxxDxDxE, are boxed. Residues responsible for the catalytic activity are indicated with asterisks. Sequence fragments displaying the typical motifs with the G. antarctica PI12 catalytic domain include Amanita muscaria, Laccaria bicolor, Coprinellus congregatus, Puccinia triticina and Taiwanofungus camphorates. To investigate the evolutionary relationship among the cold-adapted chitinase identified in this work and others reported in the literature, phylogenetic analysis was performed. The search for complete protein sequence was explored using the NCBI BlastP service. A total of 24 chitinase sequences (all hits with an e-value lower than 6 × 10-20) were downloaded and aligned using clustal X. From this alignment, a NJ tree was constructed to examine the distances among these sequences. An NJ tree was then inferred and the tree topology was analysed using bootstrapping (1000 replicates). The chitinase of Streptomyces griseus, which did not coincide with the taxonomic status of the CHI II, was used as an out-group in order to root the tree. The analysis summarised in Figure 3 shows that the chitinase sequences clustered into two supported subgroups corresponding to clade I and II, which are both monophyletic clades. The monophyletic lineages provided a support for the hypothesis that clade I and II chitinases are likely to have evolved from one common ancestor . 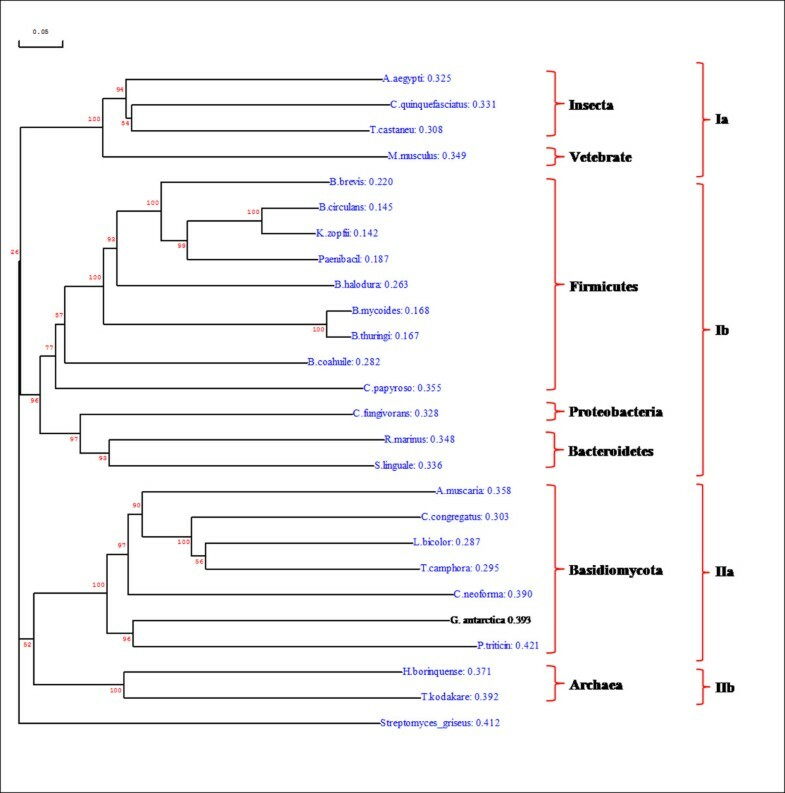 Clade I consists of two subclades; chitinases from Vertebrate and Insecta were clustered and formed the subclade Ia, while chitinases from the bacteria domain (Firmicutes, Proteobacteria and Bacteroidetes) were clustered and formed the subclade Ib. Chitinases from Basidiomycota and Archaea were clustered and formed the second monophyletic clade (clade II) that consisted of subclade IIa (Basidiomycota) and subclade IIb (Archaea). CHI II chitinase from G. antarctica PI12 was clustered in the Basidiomycota group, which was well supported by bootstrapping (NJ: 100%). Homology values ranging between 21 to 54% were found when comparing CHI II with the other Basidiomycota chitinases. Orikoshi et al. found that the redundancy of the chitinase genes within the same species may reflect their functional difference between related proteins and also the adaptive evolution of the chitinases. Bootstrap values, an index of the accuracy of the phylogenetic tree, were found to be higher outside the tree but lower inside the tree, which may indicate the low relative diversity of all the sequences used in the analysis . Phylogenetic tree showing the relationship between CHI II from G. antarctica PI12 and other chitinases. The chitinase gene of S. griseus was used as an out-group to root the tree. Confidence values were assessed from 1,000 bootstrap replicates of the original sequence data. The expression of CHI II was conducted in a P. pastoris expression system. Culture condition is one of the critical parameters that significantly affect cell growth and the yield of recombinant product. Stress imposed by cultivation conditions or strategies can lead to a decrease in cell viability, which in turn lowers productivity and induces cell lysis . In this study, the highest extracellular chitinase activity was found to be 1.24 U ml-1 at 120 h post-induction when cells were grown in BMMY medium (pH 6.0) at 25°C with 1% (v/v) methanol as inducer. Yield of the recombinant CHI II expressed in P. pastoris was shown to be significantly improved at low temperatures. This could be due to the characteristic of psychrophilic proteins to be stable at low temperatures when compared with other mesophilic chitinases [24, 31] expressed in P. pastoris. Hong et al. reported that high cultivation temperatures can induce the release of proteases from dead cells and may also affect the protein folding process. SDS-PAGE and western blotting analysis of the crude supernatants at the inducible period from 24 to 120 h showed two clearly visible protein bands with a molecular mass of approximately 39 and 50 kDa, respectively (Figure 4a and 4b). This study shows that P. pastoris is the suitable host for the production of cold-adapted protein such as CHI II. 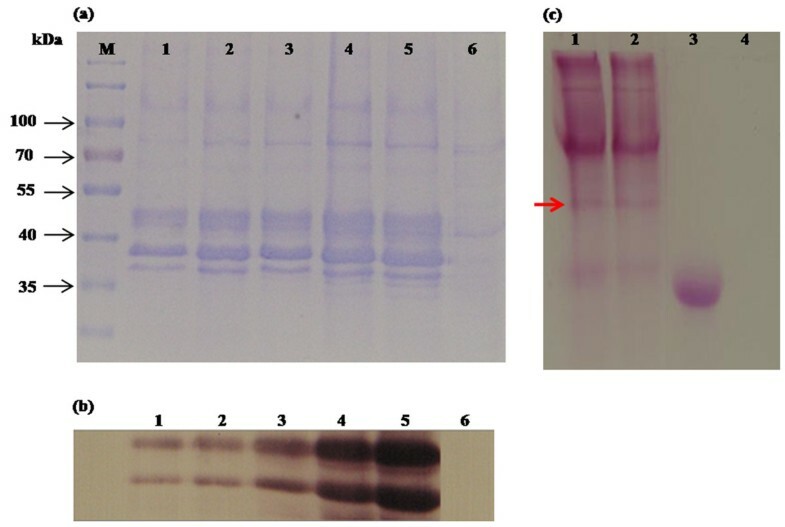 Similar finding for the high yield production of recombinant protein in methylotrophic yeast P. pastoris was obtained for other cold-adapted chitinase such as in the case of endochitinase from Sanguibacter antarcticus. SDS-PAGE, western blot and glycosylation analysis of recombinant CHI II protein in P. pastoris GS115. (a) SDS-PAGE of transformant, M: protein molecular mass marker; Lanes 1-5: transformants induced by methanol for 1 to 5 days; Lane 6: control, GS115 transformed with empty pPICZαA and induced by methanol for 5 days. (b) Western blot of transformant, Lanes 1-5: transformants induced by methanol for 1 to 5 days; Lane 6: control, GS115 transformed with empty pPICZαA and induced by methanol for 5 days. (c) Glycosylation analysis of transformant, Lanes 1-2: transformants induced by methanol for 4 to 5 days; Lane 3: Horseradish Peroxidase Positive Control; Lane 4: Soybean Trypsin Inhibitor Negative Control. A 50 kDa protein was positively stained and indicated by an arrow. The recombinant chitinase CHI II protein (encoding CHI II mature protein) had an apparent molecular mass of about 39 kDa, less than the theoretically calculated molecular mass of 40.86 kDa. Another apparent band of about 50 kDa is higher than the calculated molecular mass and was predicted to be post-translationally modified and a glycosylated form of CHI II in P. pastoris. 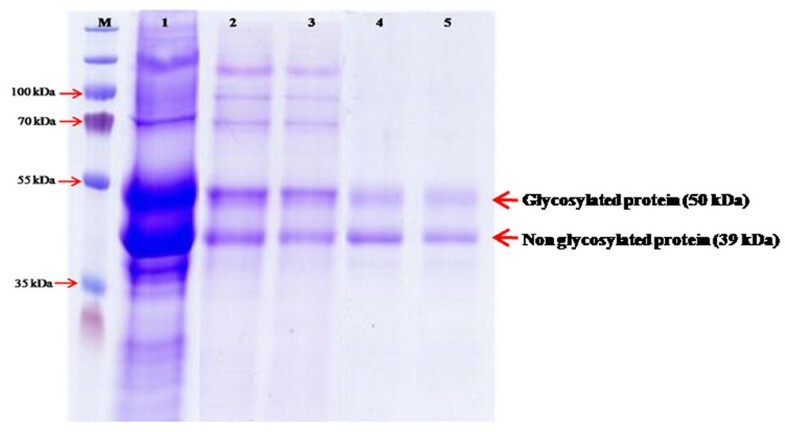 A GelCode Glycoprotein Staining kit was used to confirm the glycosylated moiety of the expressed chitinase in the polyacrylamide gel. As presented in Figure 4c, the 50 kDa band was positively stained, appearing as a magenta band with light pink background, whereas the 39 kDa band was not, indicating that the 50 kDa band was glycosylated. One putative N-glycosylation site (Asn-Xaa-Thr/ser) was found in the mature protein when the amino acid sequence were analysed using NetNGlyc 1.0 Server , while there was four potential O-glycosylation sites predicted using NetOGlyc 3.0 Server . In eukaryotes, enhanced protein stability is often achieved by glycosylation resulting in protection by the attached sugar moieties. In P. pastoris, N-glycosylation is a common post-translational modification that enhances protein stability. Previous studies of chitinases from Haemaphysalis longicornis and Oryza sativa L.  found larger proteins than the predicted molecular masses, implying that these chitinase proteins underwent post-translational modification. To examine the catalytic properties of CHI II produced by P. pastoris, the recombinant enzyme was purified to homogeneity using HisTrap ™ HP Columns from GE Healthcare. The purified recombinant chitinase CHI II was resolved as two bands by SDS-PAGE as shown in Figure 5. Purification of recombinant chitinase (CHI II). Approximately 20 μl of sample was loaded into each well. M: protein molecular mass marker; Lane 1: crude concentrated enzyme; Lane 2 & 3: unbound fraction; Lane 3 & 4: elution fraction. To determine the pH and temperature optima of the CHI II, the enzyme's activity was assayed at different pH levels and temperatures. The effect of pH on the chitinolytic activity was studied with a citrate-phosphate buffer (pH 2.5 to 6.5) and a potassium phosphate buffer (pH 6.0 to 8.0). Purified CHI II exhibited enzymatic activity over a pH range of 2.5 to 6.5 (measured at 15°C) and the activity of the purified chitinase was increased with increasing pH up to pH 4.0 in citrate-phosphate buffer. It was found that the optimal pH was 4.0 with more than 80% of the relative chitinase activity retained at the acidic condition of pH 3.5, as shown in Figure 6a. Alternatively, the optimum pH for chitinases produced by the psychrotolerant bacterium Vibrio sp. strain Fi:7 was pH 8.0  while cold-adapted chitinase (ChiB) from a marine bacterium, Alteromonas sp. Strain O-7 is pH 6.0 . At pH 4.5, the enzyme activity began to decline, resulting in a relative chitinase activity below 80%, while at pH 6.5, the relative activity was only about 10%. Even though the chitinase activity declined, purified chitinase was found to be stable. More than 80% of the maximum activity was retained at pH 3.0 to 3.5, but activity began to be lost after an incubation at a pH over 4.0. Extreme pH levels reduced the enzyme's ability to perform its catalytic activity. Most of the fungal chitinolytic enzymes have an optimum pH between 4.0 and 7.0 . Effect of pH (a) and temperature (b) on chitinase activity and stability. The highest chitinase activity was set to 100%. The effects of temperature on the recombinant chitinase's activity and stability were also determined. The optimum temperature for CHI II activity was 15°C (Figure 6b). The thermal stability of chitinase was measured by incubating an aliquot of the enzyme at different temperatures for 30 min and then assaying the residual activity under optimal pH and temperature conditions. Chitinase was stable at 15°C for 30 min and retained more than 90% of its initial activity when incubated at 10°C. Incubation at 20°C resulted in a 20% loss of the residual activity, while more than 70% of the maximal activity was retained when the enzyme was incubated at 5°C and 25°C. Moreover, the residual activity of the enzyme was 50% lower when incubated at 30°C. In general, cold-adapted enzymes display an apparent optimal activity shifted toward low temperatures and also heat lability . It has been proposed that increased flexibility is the most important factor for the catalytic efficiency of cold-adapted enzymes at low temperatures , which is achieved through a combination of structural features . Noticeably, the optimum temperature of CHI II (15°C) was much lower than those reported for the chitinase from Moritella marina (28°C) , cold-adapted chitinase B of Alteromonas sp. strain O-7 (30°C)  and chitinase A of Vibrio sp. strain Fi:7 (30°C) , yet the reasons for this finding remain unclear. The catalytic activity of CHI II was strongly affected by the addition of Ca2+ and Fe2+ and was moderately inhibited by the other metal ions, such as Na+, Zn2+ and Cu2+, which is comparable to the endochitinase from Bacillus cereus (Figure 7). Chitinases from different fungi exhibit different responses to various metal ions . It was reported that EDTA was an inhibitor of chitinase, e.g., it inhibited the chitinase from Enterobacter sp. NRG4 . However, the addition of EDTA did not affect the catalytic activity of CHI II, suggesting that these chitinases may have different catalytic mechanisms. Differing from the Trichoderma virens UKM-1 endochitinase , which was completely inhibited by Mn2+ and Co2+, CHI II was activated by the presence of both Mn2+ and Co2+, which enhanced the activity about 10 to 20%. Moreover, K+ also increased the activity of the recombinant CHI II to about 15%, while the CHI46 chitinase from Chaetomium globosum was inhibited by K+. These results showed that chitinases could be activated or inhibited by certain metal ions. However, the chitinases from different species may be stimulated or inhibited by different ions. Effect of metal ions and reagents on the recombinant CHI II chitinase activity. No addition (with no metals added to the enzyme solutions) was used for 100% relative activity. Chitinases from different sources can use a variety of substrates. In this study, CHI II showed the highest activity toward colloidal chitin (0.690 U/ml) followed by swollen chitin (0.570 U/ml), carboxymethyl chitosan (0.465 U/ml), and glycol chitosan (0.278 U/ml). When a native chitinase from G. antarctica PI12 were tested against the same substrates, highest activity was exhibited with colloidal chitin (0.424 U/ml), followed by swollen chitin (0.340 U/ml), carboxymethyl chitosan (0.320 U/ml), and glycol chitosan (0.0615 U/ml). These observations show similar activity profile between the recombinant and native chitinase. The preference for hydrolysis of colloidal chitin over other substrates probably reflects that increased accessibility of colloidal chitin to the chitinase active site due to the removal of lipids and proteins from the crab shell chitin after acid hydrolysis treatment , while glycol chitosan is chemically different. The higher specificity to the colloidal chitin substrate was similar to that from Trichoderma virens. However, its low hydrolytic activity against glycol chitosan was different from a previous study of chitinase from Schizophyllum commune. Using the purified enzyme of CHI II, kinetic experiments were performed at a temperature of 15°C by varying the substrate concentration in a standard activity test from 2.0-10.0 mg ml-1. On the basis of the Lineweaver-Burk plot, the values of kinetic constants Km, Vmax, and subsequently kcat, and kcat/Km of CHI II towards different substrates (colloidal chitin, swollen chitin and carboxymethyl chitosan) were calculated as shown in Table 1. Using colloidal chitin as a substrate, a higher value of Vmax, which was 3.559 μmol μg-1 h-1, was achieved compared to other substrates. The higher Vmax value indicates the higher efficiency of the enzyme and suggests that CHI II chitinase has a higher catalytic efficiency towards colloidal chitin as compared to the swollen chitin and carboxymethyl chitosan. The Km values of CHI II against different substrates were 27.918 mg ml-1, 13.83 mg ml-1 and 26.79 mg ml-1, with colloidal chitin, swollen chitin, and carboxymethyl chitosan, respectively, which are comparatively higher than the other reports in literature [45, 46]. Stefanidi et al. suggested that enzymes produced by marine bacteria work at saturating concentrations of chitin and showed the high values of the Km constant. On the contrary, some cold-adapted enzymes have a lower Km than their thermostable homologues. For secreted enzymes from marine microorganisms, the requirement for a low Km may relate to the need to scavenge substrates that are at low concentrations in the environment . Furthermore, the Kcat value of CHI II was also found to be highest with colloidal chitin, which was 0.915 s-1 and followed by carboxymethyl chitosan (0.701 s-1) and swollen chitin (0.693 s-1). The results support the Vmax value that indicated that CHI II had a lower turnover efficiency towards carboxymethyl chitosan and swollen chitin than towards colloidal chitin. However, the specificity constant kcat/Km is generally a better indication of the catalytic efficiency than kcat alone . Comparable with the Km value, the kcat/Km values suggested that CHI II had a higher catalytic efficiency towards swollen chitin than colloidal chitin and carboxymethyl chitosan at low temperatures. A previous study found that a higher Km and kcat are also characteristics of lactate dehydrogenase (LDH-A4) enzymes from a cold-water fish where a higher Km results in a decrease in ΔGES, with a concomitant decrease in the energy of activation required to form the transition state, thereby increasing the kcat. Therefore, the strategy used to maintain sustainable activity at a permanently low temperature is to enhance the kcat and kcat/Km values instead of decreasing the Km. In this study, a chitinase from G. antarctica PI12 was isolated, purified and characterised. The protein displays an optimum catalytic activity at an apparently low temperature and pH. Due to its high versatility regarding its pH range, temperature range and substrate specificity towards chitin polymers, the G. antarctica PI12 family 18 chitinase seems to be a highly attractive enzyme for the production of chitooligosaccharides, and more generally for biotechnological applications such as for the biocontrol of microbial spoilage of refrigerated foods and use as a mycoparasite of phytopathogenic fungi in cold environments. The psychrophilic yeast, G. antarctica PI12 was obtained from School of Biosciences & Biotechnology, Universiti Kebangsaan Malaysia, Malaysia. Escherichia coli JM109 (Promega) was used as cloning host. The pPICZα A vector (Invitrogen), which can propagate in both bacterial and yeast systems, was used for initial cloning in bacteria and subsequent expression in yeast. P. pastoris GS115 (Invitrogen) was used for heterologous protein expression. G. antarctica PI12 was grown on Yeast extract Peptone Dextrose (YPD) and chitinase induction medium (0.3% (w/v) yeast extract, 0.5% (w/v) peptone, 0.3% (w/v) NaCl and 3% (w/v) colloidal chitin), both containing 25 μg/ml ampicillin and 25 μg/ml kanamycin. The G. antarctica PI12 cells were incubated at 4°C for 7 to 8 days. E. coli JM109 was grown in Luria Bertani (LB) medium with 100 μg/ml ampicillin as a selectable antibiotic. Media and protocols used for P. pastoris are described in the Pichia expression manual (Invitrogen). Restriction enzymes were obtained from Promega and New England Biolabs (NEB), while all other chemicals were of analytical grade and were obtained from Sigma, Amresco, Fluka or Merck. Total RNA was extracted from G. antarctica PI12 using a method as described by Sokolovsky et al. . Briefly, G. antarctica PI12 was grown at 4°C for seven days in chitinase induction medium. RNA was purified and used immediately for cDNA synthesis or stored at -80°C. All primers used in PCR amplifications are listed in Table 2. The partial cDNA fragment of G. antarctica PI12 chitinase was amplified using primers LChi (F) and LChi (R) and an RT-PCR System (Promega), as recommended by the manufacturer. The primers were designed based on the Genome Sequencing Survey (GSS) Database of G. antarctica PI12 available at Malaysia Genome Institute (MGI). The resulting DNA fragment was used as a template for a subsequent RACE amplification to obtain the full-length CHI II sequence. 3' RACE was performed using primer 3-RC and a CapFishing™full-length cDNA Premix kit (Seegene) while 5' RACE was performed using primer 5-RC and a SMART™ RACE cDNA Amplification kit (Clontech), as recommended by the manufacturers. Using the sequence information from the RACE result, the full-length gene of chitinase was amplified using primer CHI-Rev and CHI-For via RT-PCR. DNA sequences amplified by PCR were confirmed by nucleotide sequencing (First BASE Laboratories). The phylogenetic relationship of CHI II was generated with 24 other deduced chitinases available from the NCBI databases as shows in Table 3. 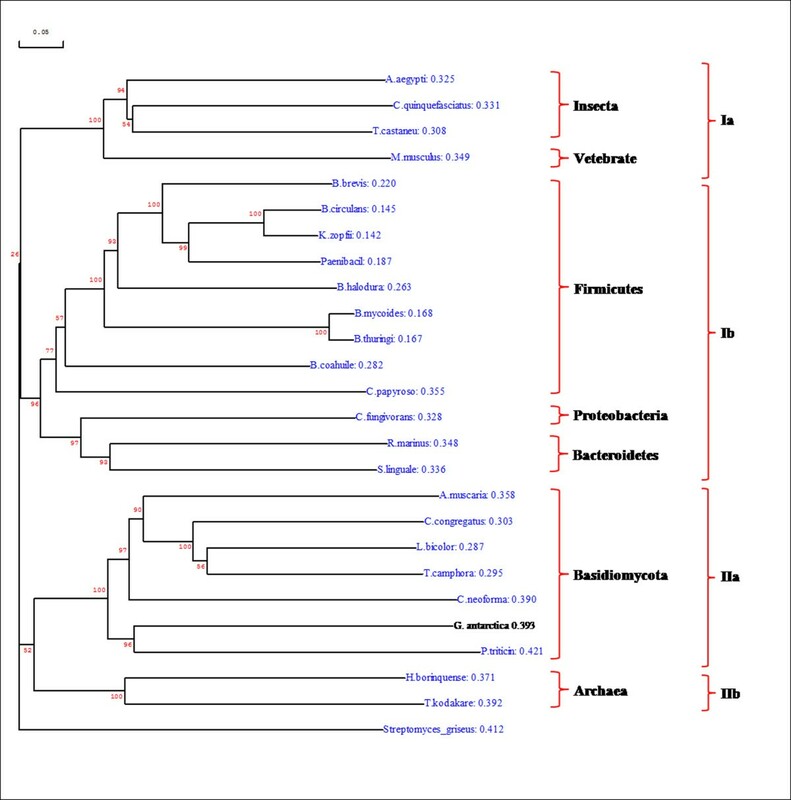 A phylogenetic tree was constructed by multiple sequence alignment using clustal X  and was generated using the Neighbour-Joining method (NJ) and bootstrap analysis. The phylogenetic tree was visualised using Treeview software. Confidence values for individual branches were assessed from 1000 bootstrap replicates of the original sequence data. The mature CHI II sequence was PCR amplified using primers CHI-Not I and CHI-Xba I and with the full-length cDNA as a template. The resulting DNA fragment (1100 bp) was digested with Not I and Xba I before being ligated into the corresponding sites of the pPICZαA vector and termed plasmid CHI II-pPICZαA. The recombinant enzyme was constructed such that the native signal peptide of the G. antarctica PI12 chitinase was replaced by the Saccharomyces cerevisiae α-factor signal peptide and was cloned in frame with the C-terminal tag. The ligation product was transformed into E. coli JM109. The correct sequence of the expression plasmid was confirmed by DNA sequencing. Transformation of recombinant CHI II into P. pastoris GS115 was performed as recommended by the manufacturer (Invitrogen). Briefly, CHI II-pPICZαA was linearised using Pme I. The purified DNA product (2-5 μg) was transformed into competent P. pastoris GS115 cells via electroporation. Transformants were selected by plating onto YPD agar plates containing 100 μg/ml zeocin. The methanol metabolisation phenotype (Mut+) of P. pastoris recombinants was analysed by colony PCR using universal primers 5' AOX and 3' AOX. Colonies that produced a 1700 bp (plus the size of the parent plasmid) PCR product were selected and kept for subsequent analysis. P. pastoris GS115 transformants were grown in 100 ml of fresh Buffered Complex Medium containing Glycerol termed as BMGY medium (1% (w/v) yeast extract, 2% (w/v) peptone, 100 mM potassium phosphate (pH 6.0), 1.34% YNB, 4 × 10-5% biotin and 1% (v/v) glycerol) in a 1000 ml baffled flask at 29°C and 250 rpm until the culture reached an A600 of 2-6 (approximately 18-20 hours). To induce CHI II production in P. pastoris, the cells were harvested and resuspended in Buffered Complex Medium containing Methanol or known as BMMY medium (1% (w/v) yeast extract, 2% (w/v) peptone, 100 mM potassium phosphate (pH 6.0), 1.34% YNB, 4 × 10-5% biotin and 0.5% (v/v) methanol) using 1/5 of the original culture volume (20 ml). Absolute methanol was added every 24 hours to a final concentration of 1% (v/v) to maintain induction. To analyse expression levels and the optimal time post-induction for harvest, the culture supernatant was collected at 1, 2, 3, 4 and 5 days. Expression of secreted proteins was analysed by SDS-PAGE. All purification steps were performed at 4°C. The crude enzyme was concentrated by an Amicon concentrator 10,000 MWCO (MILIPORE) followed by purification using HisTrap™ HP Columns (GE Healthcare). The purified protein was collected and characterised further. The purified proteins were analysed by SDS-PAGE on a 10% gradient gel. Chitinase activity was measured using 3, 5-dinitrosalicylic acid (DNS) as described by Miller et al. but with some modifications. The reaction mixture contained 0.25 ml of 10% colloidal chitin in 0.2 M sodium acetate buffer (pH 4.0) and 0.25 ml enzyme solution. After an incubation at 15°C for 1 h, the reaction was terminated by boiling at 100°C for 5 min. The reaction mixture was centrifuged at 8,000 × g for 1 min. Next, 0.75 ml of DNS reagent was added to the aliquots of 0.25 ml reaction mixture that was then boiled at 100°C for 10 min. After cooling, the reducing sugars that were released as a result of the chitinase activity were measured at 540 nm using a UV spectrophotometer. One unit (U) of the chitinase activity is defined as the amount of enzyme that is required to release 1 μmol of N-acetyl-β-D-glucosamine per hour under the assay conditions. Protein content was measured according to the method of Bradford  using bovine serum albumin (BSA) as a protein standard. The reaction was measured at a wavelength of 595 nm. Sodium dodecyl sulphate-polyacrylamide gel electrophoresis (SDS-PAGE) was conducted to analyse the recombinant protein expression by the method of Laemmli  and the gel was then stained with 1% Coomassie Brilliant Blue R-250. Western blotting was performed by colorimetric detection using a His-Tag monoclonal antibody, as recommended by the manufacturer (Novagen). Glycoprotein sugar moieties in the polyacrylamide gel were detected using a GelCode glycoprotein staining kit (Pierce Biotechnology) according to the instructions provided by the manufacturer. The optimum pH for the purified CHI II was evaluated at 15°C over a pH range of 2.5 to 8.0, using appropriate buffers (100 mM), citrate-phosphate buffer (pH 2.5 to 6.5) and potassium phosphate buffer (pH 6.0 to 8.0), under CHI II chitinase assay procedures. The pH stability of the enzyme was investigated further at 15°C by pre-incubation of the enzyme solutions in the described buffer systems in the absence of substrate for 30 min. The reaction mixture was then subjected to the CHI II chitinase assay and a pH profile was produced with the enzyme activity at the optimum pH set to 100%. The optimum temperature for purified CHI II activity was measured by incubating the purified enzyme for 30 min at temperatures ranging from 5°C to 30°C. The thermostability of CHI II was also investigated at temperatures of 5°C to 30°C after incubation of the enzyme solutions in the absence of substrate for 30 min. A temperature profile was produced with the enzyme activity at the optimum temperature set to 100%. Metal ions are generally considered to be important factors affecting microbial enzyme activity. The reaction mixture consisted of purified enzyme in 100 mM citrate buffer (pH 4.0) containing 1 mM metal ions (K+, Cu2+, Mn2+, Fe2+, Co2+, Ca2+, Na+ and Zn2+) and different reagents (such as 1 mM EDTA and 1% SDS). 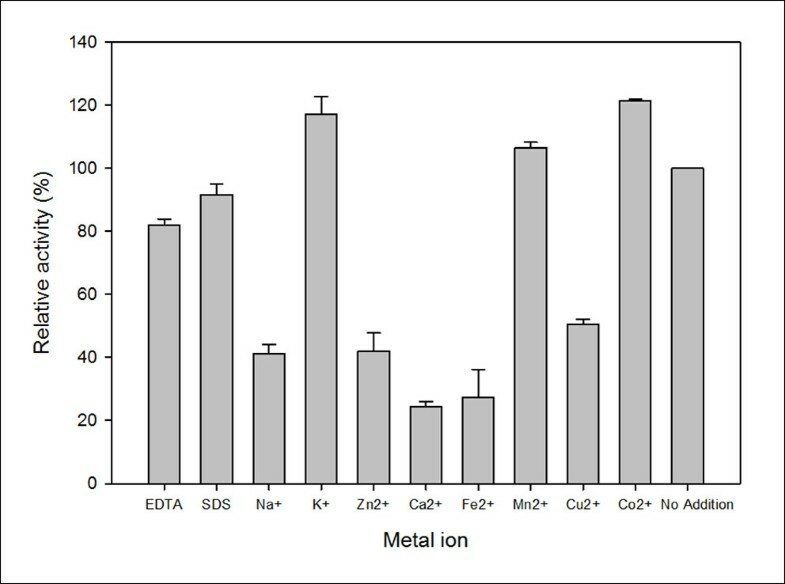 The effect of these metal ions was investigated using the CHI II chitinase assay system. The system without any additives was used as a control. The substrate specificity of CHI II was determined by measuring the enzyme activity after incubation in 100 mM citrate buffer containing 1% of each substrate (colloidal chitin, swollen chitin, glycol chitosan and carboxymethyl chitosan) at pH 4.0 and 15°C for 1 h. The amount of reducing sugars produced was estimated by using the DNS method as described above. The kinetic parameters (Km, Vmax, kcat, and kcat/Km) of the purified enzyme were studied. Different substrate (colloidal chitin, swollen chitin and carboxymethyl chitosan) concentrations were used, ranging from 2.0 to 10.0 mg ml-1. The reaction rate versus substrate concentration was plotted to determine whether the enzyme obeys Michaelis-Menten kinetics. The Michaelis-Menten constant (Km) and maximum velocity of substrate hydrolysis (Vmax) were determined from the Lineweaver-Burk plots. This work was supported by a research grant from the Molecular Biology & Genomic Initiative Program, Malaysia Genome Institute (Project No. 07-05-16-MGI-GMB02). NMM, RMI developed the concept and design the study. ANMR performed experiments and wrote the manuscript. AR, AMAM, FDAB, RMI edited the manuscript. RMI gave technical support and conceptual advice. All authors have approved the final article to be submitted as manuscript.